Sometimes bigger IS better. Take our ever popular Clermont Mural. We show it in our catalog on 6" x 6" tiles, which makes the whole mural 18" x 30". But like all of our tile designs, we can make this tile mural in any size that you desire. And when we say ANY size, we really do mean it. 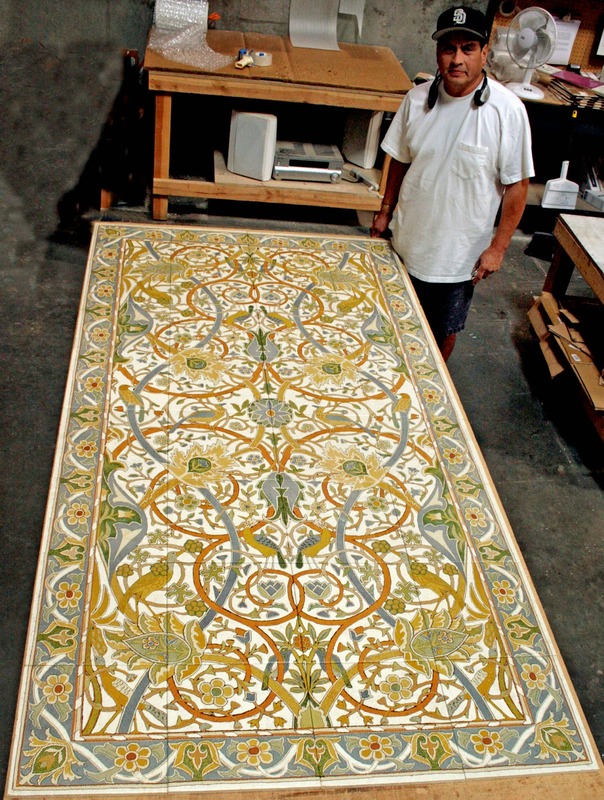 Roger is showing off a 4 foot x 8 foot Clermont Mural that we created for a customer in Texas. What is it they say - "Everything is bigger in Texas." In this case, we believe it! So the lesson of the day is that as you are looking through our tile catalog or the tile collections shown on our website, don't forget that you can change the size of any of our tile designs to fit your space. Contact your local tile shop for information about how to order StoneImpressions tile.